The 1031 exchange has existed since the 1920s, yet many people are missing out on the opportunities it presents. David Moore of Equity Advantage explains the basic parameters of the 1031 exchange and the benefits it offers to investors. Whether you are looking to buy or sell, this is information you need. 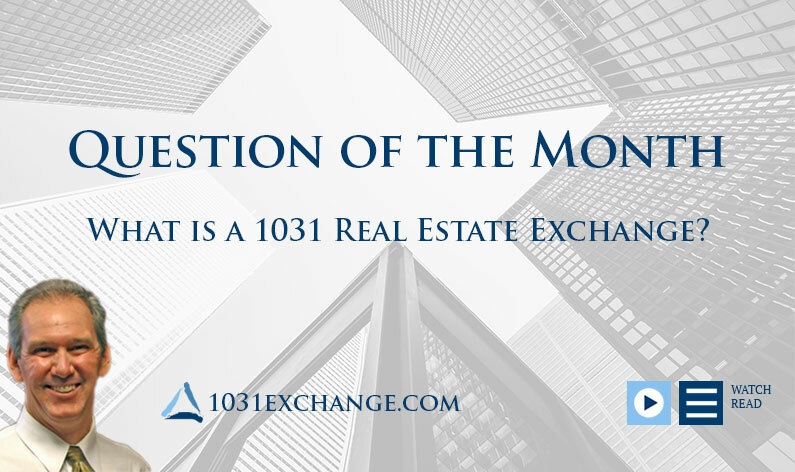 What Is a 1031 Real Estate Exchange? The 1031 exchange has been in existence since the 1920s, and it allows an investor to sell a property, reinvest the proceeds in a new property, and defer all capital gain taxes. Historically, we were able to handle exchanges of personal property and real property. But tax reform eliminated our ability to handle personal property transactions (cars, boats, planes, and so forth). Today any 1031 exchange is a real property exchange, or real estate exchange. When we look at the process, historically people often think of it in the context of you’ve got something, I’ve got something, we swap properties. The problem with that is you have to actually find things—people with assets that match up value- and equity-wise. You’ve got what I want, I’ve got what you want, and we can do a swap. Well, that sort of evolved into what’s called a three-way exchange or an accommodated exchange where you’re using an intermediary (an accommodator or a facilitator) who is paid a fee to step into the middle of your sale and purchase, and we convert it into an exchange. As far as the taxpayer is concerned, when you’re selling property and you’re going out to buy new property, it’s the accommodator’s job to create an exchange out of that event. When we’re talking about it in broad terms, I think of some basic parameters. First, it has to be an exchange—you give us something, we give you something back. Next, what is received will have to be of like kind to what is sold. Like kind refers to the nature of the investment rather than the forum. Third, you have to satisfy what we call a napkin test, which says that you must go across or up in value and equity. There’s a great deal of misunderstanding about that aspect. Let’s look at that a little more closely. For some reason, many people say you have to replace debt in an exchange. This is totally untrue. Such a scenario could go two ways: one by going down in value, which triggers tax because you went down in value; and the other way debt could be replaced is by adding funds to the transaction, which is always fine. When we have recessionary times, the loan to values change, and maybe equities change. We’ve had people come to us and say, “Hey, I don’t want any debt on the replacement property. Do I need to pay off the relinquished property in advance?” You don’t have to do that; you could always add money to that replacement property. Value and equity are the critical issues, and if you don’t fully meet the exchange requirement, you’re just going to pay taxes and difference. It’s not all or nothing, so you don’t need to worry about that. Every dollar more you spend on something that you want costs you another dollar. If you don’t spend it, then maybe it’s thirty or forty cents in tax. Finally, we have to have continuity investing and that just means that the taxpayer who has relinquished it has receipts so that we can give something back to the person or entity that gives us something. It sounds easy, but it can be complicated because the finance world so often doesn’t see eye-to-eye with the tax and legal world. Continuity of investing is one of the major headaches with 1031 exchanges. That and timing. The 1031 exchange is a great tool—one of the most important tools in your portfolio to make things happen and keep your money yours. It’s a tremendous wealth-building tool, it’s very inexpensive to use, and it can allow you to accomplish all kinds of things.